Howdy, podners. Mighty glad to have you visit us here in Montana. 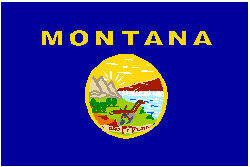 Under the word Montana on a blue field is the State Seal. The Seal shows some of Montana's beautiful scenery. The pick, shovel and plow represent mining and farming. In the background, the sun rises over mountains, forests and Great Falls of the Missouri River. Montana's State Capital is Helena. The beautiful song of the Western Meadowlark is just one of the reasons it was chosen as the State Bird. 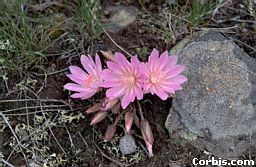 The delicate Bitterroot is Montana's State Flower. The Ponderosa Pine, State Tree, is seen reaching for the Big Sky of Montana. Montana shares its borders with Idaho, North Dakota, South Dakota and Wyoming. Their State Song is "Montana" and you're listening to it now. An Uncle of our dear friend and fellow Drifter, Jan, wrote the following poem in the 1930's. Please enjoy it before we start our tour. Spread beauty with lavish hand. And slopes are darkly green. Her lakes are deep and icy. Her breezes are cool and free. Said "LAND OF THE SHINING MOUNTAINS"
And Montana received her name. But the "Land of Shining Mountains"
Will always remain the best! Well, if you're all saddled up and ready to ride (sorry), if you're all in the Chevy and ready to roll, click on the sign and let's go see Montana at its best.